Around a quarter of the globular star clusters in our Milky Way galaxy are invaders from other galaxies, according to a team of scientists from Swinburne University of Technology in Australia. In a paper accepted for publication in Monthly Notices of the Royal Astronomical Society, Swinburne astronomer Professor Duncan Forbes has shown that many of our galaxy’s globular star clusters are actually foreigners - having been born elsewhere and then migrated to our Milky Way. Previously astronomers had suspected that some globular star clusters, which each contain between 10000 and several million stars were foreign to our galaxy, but it was difficult to positively identify which ones. 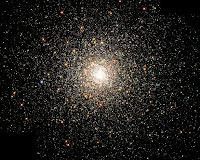 Using Hubble Space Telescope data, Forbes, along with his Canadian colleague Professor Terry Bridges, examined globular star clusters within the Milky Way galaxy. “Using this database we were able to identify key signatures in many of the globular star clusters that gave us tell-tale clues as to their external origin,” Forbes said. The researchers’ work also suggests that the Milky Way may have swallowed up more dwarf galaxies than was previously thought. “We found that many of the foreign clusters originally existed within dwarf galaxies - that is ‘mini’ galaxies of up to 100 million stars that sit within our larger Milky Way. “Our work shows that there are more of these accreted dwarf galaxies in our Milky Way than was thought. Astronomers had been able to confirm the existence of two accreted dwarf galaxies in our Milky Way – but our research suggests that there might be as many as six yet to be discovered. "Although the dwarf galaxies are broken-up and their stars assimilated into the Milky Way, the globular star clusters of the dwarf galaxy remain intact and survive the accretion process."